Evans-Elbert Ranch / Elbert-Austin Ranch in 1980. In 1868, John Evans and Samuel H. Elbert established a mountain cattle ranch that eventually covered much of the Vance, Metz, and Corral Creek valleys and uplands of Jefferson County. 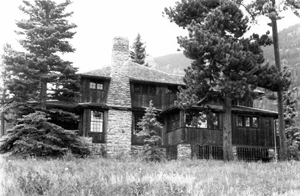 A 1908 log and stone Rustic style residence on the property was built for Louise Elbert Everett. It was designed by J. Christopher Jensen, an Iowa architect, and constructed by Jock Spence, a prominent local contractor.